While I was volunteering as a consultant for my sister, BJ was busy working on some projects of her own. She visited a number of quilting shops on our Northwest trip. Along the way, she landed on the concept for a project she wanted to do. 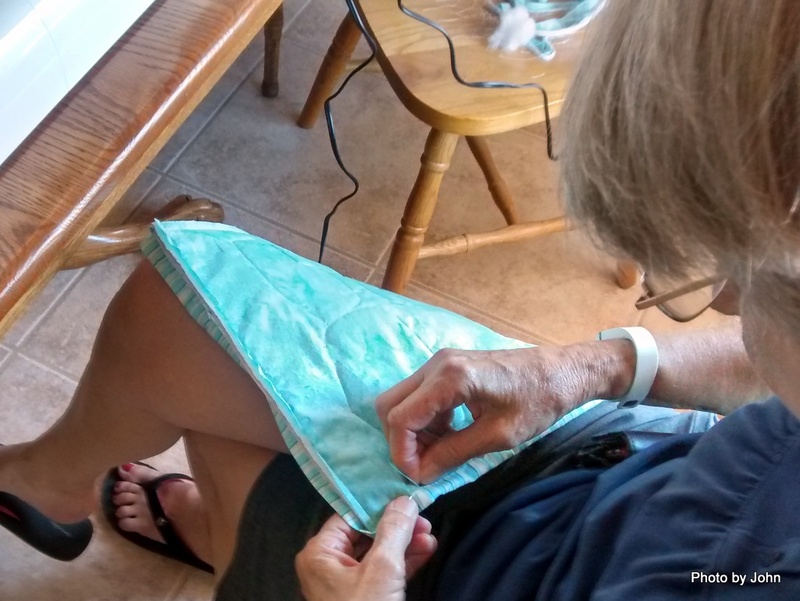 She started out leveraging some fabric she'd found to make some large hot pads. And then she leveraged a pattern to do some applique. 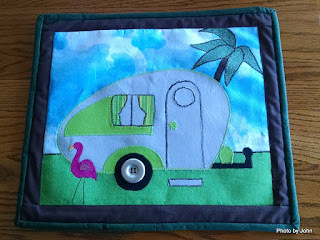 This one was done to match the colors of our friend's Tab trailer. She's paid more attention to our to-do list from our Northwest trip than I have. This was her solution to keep the sensor for the refrigerator thermometer in one place. We discovered our temperature readouts would change most every time we moved the trailer since the sensor was free to move around. When it dropped into the shelves on the door, the temp reported would be higher than when it was on the shelf. This way, we'll eliminate one of the variables. The big project was new curtains. 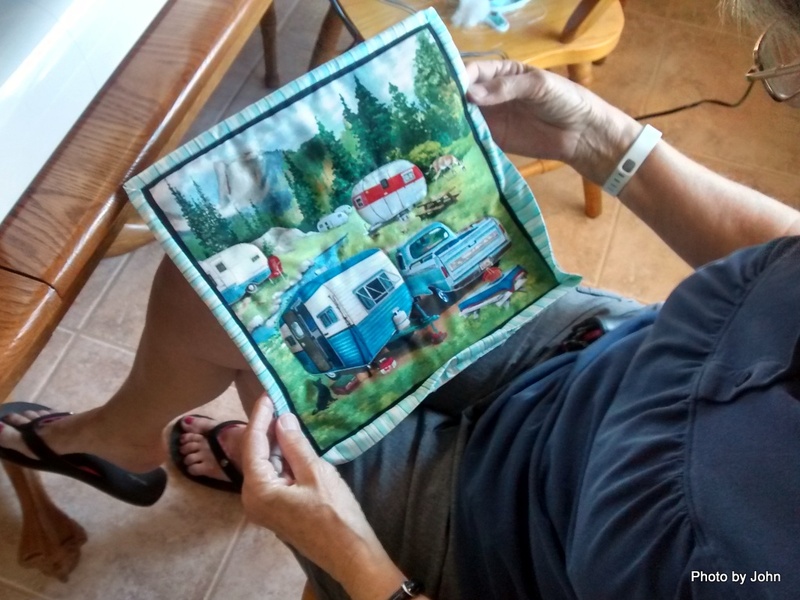 When we first got the trailer, she replaced the thin factory curtains with a heavier fabric, but she's always wished for curtains that would do a better job of blocking all the light. She bought a set of black out curtains at a local store, and cut them up in sizes needed for our windows. This fabric has a bit of texture to it, but is totally opaque. At least she hasn't made covers for the fan yet so I can still tell when the sun comes up. I'm headed up to the rim with the trailer for a week or so which will give a nice chance to test the curtains. Meanwhile, I'm not sure when the next blog post will happen. I'm a bit blogged out at this point. Between the file conversion project I've been working on, some caches I've been building, and the hot weather, we haven't been out to do much geocaching the past couple weeks. 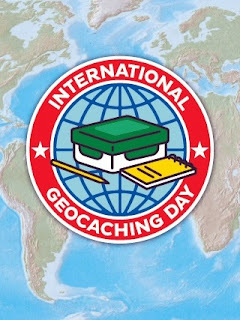 Since today is International Geocaching Day, it seemed only appropriate that we get out and do a bit of geocaching. 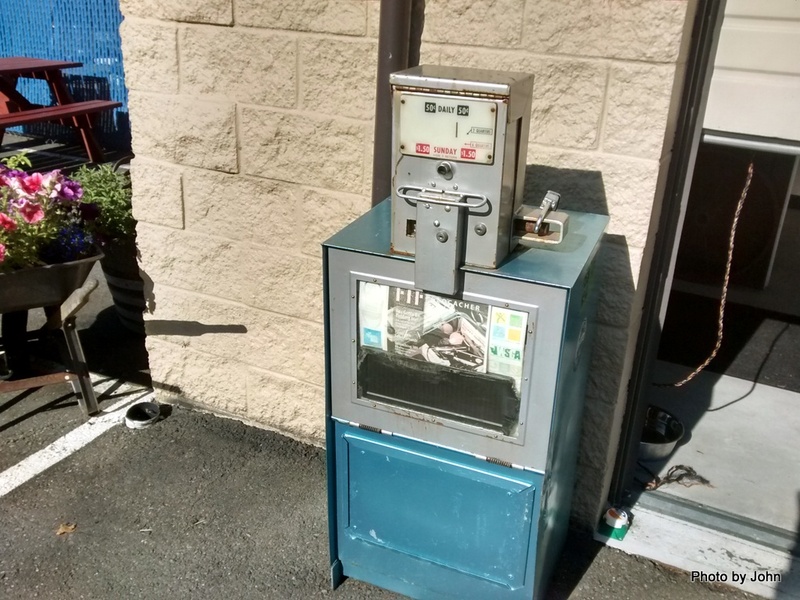 While we were in the Northwest, a local geocacher put out a series of caches honoring her grandchildren. I'd done a few of them as quick finds, but still had 8 of them on the County Line Trail that I hadn't logged yet. They became our target for the day. The weather guessers suggested that it might be a bit cooler today, but we still decided to get an early start. When we left the house at 6:15 it was very cloudy with the sun trying to break through. Some might have said it looked like rain, but we bet on improving weather. 'Sides that, a hike in the rain could be nice at these temps. and the bikes were hitting the trail. We'd started at the north end of the majority of the series (there's one more outlier in the National Forest further north), paid our daily access fee and started down the trail. Most of the bike traffic was going downhill as well. It turned out to be a beautiful morning. Comfortably warm, but not hot. Made for a great time to wander a trail that neither of us had been on before. The caches all varied in size and shape, but most contained a few trinkets. They were nicely camo'd and some were quite challenging to find, even when you were looking at them. Nice job, Nana18. It was a very nice series and it sounds like you have a great bunch of grandkids. I finally got a chance to wander to downtown Edmonds. My destination was the waterfront but I must admit I liked the classic, small town, downtown area, complete with opportunities to practise parallel parking skills. Lots of the street corners had profuse displays of flowers. to an underwater State Park on the north. The park was clearly popular with the SCUBA divers. but it was the wide variety of sculptures that caught my eye. This sculpture was placed near whale watching scope. The brass seal lions caught my attention for a moment, and then I noticed the man with his two children that was also watching them. My personal favorite was the crude rowboat with three kids. As I circled it, I kept noticing other details. The part I really appreciated was that the young man standing at the bow was holding a claw hammer in his hand, and the 'wooden' flag was nailed to the mast, complete with bent nails. After wandering the waterfront, we caught the ferry to Kingston, leaving the car in the parking lot on the Edmonds side. We wandered around Kingston a while. Jim spotted a couple chairs that he wanted for his office, but I don't think they'll fit. and this one is a picture of Mount Rainer - just use your imagination! So many caches are vitamin or medication bottles covered in camo tape. They're cheap, but that's about all they have going to them. They're not totally waterproof so the logs are often damp. Sometimes, the old plastic peanut butter jar gets the nod. Usually the ho-hum containers are hidden in a ho-hum manner. Still an excuse for a hike, even if they're not exciting to find. 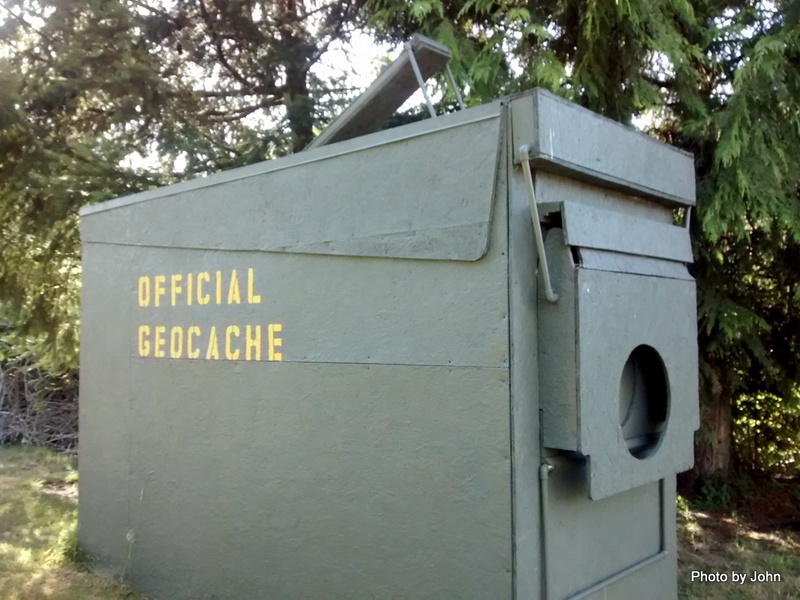 When I'm visiting an area for just a few hours or a few days, I'll typically download the local caches and then sort them based on their favorite points. 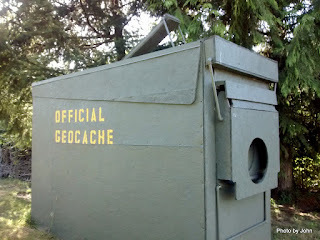 It's a quick and easy way to spot the caches others think are special. This cache was in the back corner of the owner's yard. A pretty good copy of an ammo can, but this one is 8 feet long and 4 feet wide. 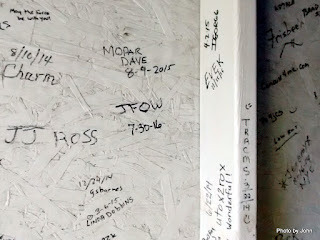 There was no logbook - you just signed the wall on the inside. This cache had earned 172 favorite points on 272 finds since it was created. This one was very easy to access, yet hidden from public view under a large cedar tree. Inside was a very nice tiki bar and in another section, space for typical swag. Guard rail caches are generally a dime a dozen, but this one had a notable collection of favorite points, so I had to stop to see why. This one was a lesson for urban geocaching. The first trick was recognizing what it was instead of what it used to be. The next trick was correctly interpreting the clues in the cache description so that you could open it. Not all of the fun caches are large. Perhaps the caching highlight of my time in Seattle was a nano-sized cache. Very nicely done, but the special part was meeting another geocacher there that was describing a similar cache in Mesa - yup, one of mine. When I was in Newberg, I'd chatted with friends about which way to go back to Seattle. I'd toyed with driving the coast route north from Tillamook, but a visit to Mount St. Helens was suggested as an option. We were out of the country when it blew, and I'd never visited the mountain, so it got the nod. I overnighted in Kelso and then headed east on Highway 504 from Castle Rock the next morning, taking my time in hopes the clouds would clear. The highway passes through the small community of Toutle Lake where their honor is defended by the fearful Fighting Ducks. Fearful if you're a slug, perhaps. 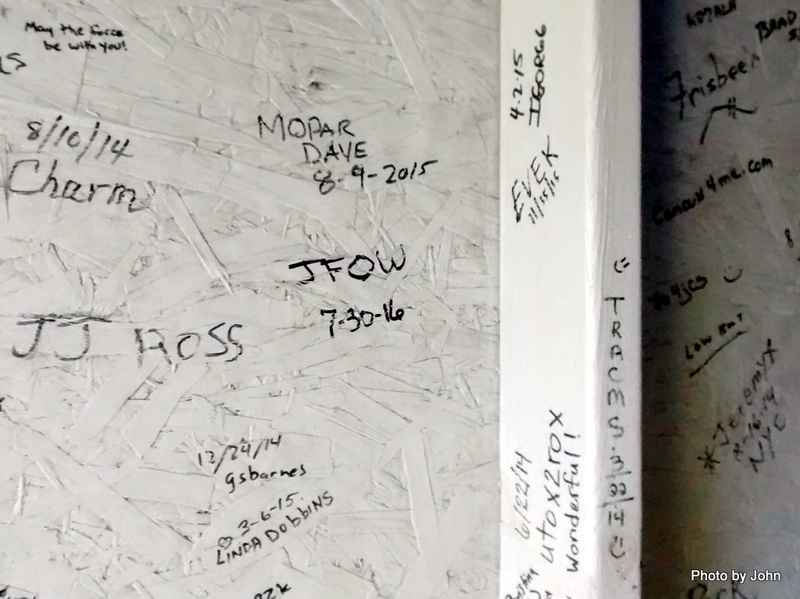 A stop at the Cowlitz County Hoffstadt Bluffs Visitor Center struck a cord with me. As soon as I saw this car I recalled all the news photos of the car, abandoned by Dave Crockett who reported the eruption as it enveloped him. The Center has some very nice photos of the mountain and of the various Spirit Lake facilities before the eruption. The day was turning out to be clear as the early clouds burned off. until I got to Coldwater Lake. What a beautiful setting! I immediately wished I had my canoe with me. With the exception of one dory with a single fly fisherman, I didn't see anyone on the lake. I spent some time wandering the wooden boardwalk that wraps around the shallow end of the lake, complete with interesting info signs about the creation and continued transition of the lake. At the Loowit Viewpoint, people were more interested in feeding the ground squirrels than they were with the view. This was the viewpoint where I started to comprehend the scale of the distruction and changes. It was also the point when I realized my earlier view of the mountain may have been the best one of the day. I thought the Johnson Rdge Observatory at the end of the road was well worth the drive. The trail beyond the hilltop featured a memorial to all the people who died in the eruption. The shattered stumps, now grey with age, tell the story of tremendous force. Much of the blowdown timber has been harvested, but it still lays like match sticks on some of the visible mountainsides. I'm so glad that I visited, and I'd look for opportunities to return, especially to visit some of the blue pockets of beauty in this amazing place. After a couple nights in a cushy (and much appreciated!) guest room in Newberg, I left as the eastern sky started to glow. My intent was to visit two oldies and make some progress back towards Seattle. If I calculated right, it should be light enough to hit the trail when I got to the first trailhead. After passing through the big town of Molalla, I came to the Forest Road that crosses and then follows the western side of the Molalla River. I'd expected it to be gravel, but it was nicely paved for the five miles I drove. Some of the logs for GC16 had mentioned the Yellow Gate Trail. It was pretty obvious where that name came from, but I would have called it a road instead of a trail. Parking was available near the I Cedar Light cache. The first portion of the "trail" was aggressively uphill until just past the "Huff and Puff" cache which was appropriately named. Just past Huff and Puff, the Yellow Gate trail intersected the Huckleberry Trail which followed the contour lines to a great extent. Once again, the "trail" had clearly served in a previous life as a logging road, but was very nicely surfaced. If the gate had been open, I'm quite sure I could have driven the antique Honda Civic I was using to within about 300 feet of the cache. I passed two more caches on the way to my goal for this part of the day. I'd seen notes suggesting some bushwhacking for the last bit of the trail, but that wasn't my experience. When I got to 90 degrees from the Huckleberry, there was a clear geopath which quickly led to a narrow but obvious trail that led closer. I suspect antenna in GPS have improved greatly. When I located the cache, my GPS was showing it still had 50 feet to go. With the 3.4 mile r/t hike to GC16 done, it was another drive across hill & dale past hay fields, occasional vineyards, and Christmas tree farms. I stopped in at the Tillamook Forest Center on Highway 6 to look at their map and inquire about gates. I left Highway 9 on what Google Maps calls Wilson River Toll Road near the Kansas Creek Cache. Unlike the previous two, in this case the road was gravel as soon as I left the highway. Much of the road was well graded, and all was easily passable until DeLorme decided I should veer left from the more heavily traveled route. At the next corner, it was evident that I wasn't going to be successful negotiating the road with the low slung Honda Civic, but I was less than 500' from the In Open Sky Country cache so I parked the car (45 29.093,-123 32.829) and started hiking. The Humbre Ridge cache apparently had lots of open views when the cache was placed in November of 2000. Now, most of the views are obscured with trees, but occasionally there would be an open spot with views across rows of ridges. Even though it was late July, the wild flowers were plentiful. The cache container had been replaced, but the original log was there which made for some interesting reading. All that was left after signing the log was to walk back to the car and see if I had enough gas to get to Tillamook. Turns out I had more than enough - I could have reversed course at the one wrong turn and driven all the way to the cache, but the hike was nice. So was the grilled ham and cheese at the Tillamook Creamery! A great way to celebrate finding three oldies (and a bunch of others) in one weekend.